This includes payments covered under the Centralized Account Processing System (CAPS). 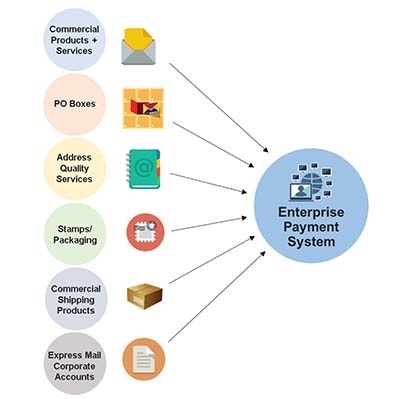 Mailers must migrate all eligible products from CAPS to EPS effective April 1, 2019. All new accounts must be established through EPS effective September 1, 2018. Note: Products not currently supported include Electronic Verification System (eVS), Parcel Return Service (PRS), PC Postage, Scan Based Payment (SBP), Merchandise Return Service (MRS), Official Mail Accounting System (OMAS), Premium Forwarding Service Commercial (PFSC™), Share Mail®, and Intelligent Mail barcode Accounting (IMbA). Customers utilizing these products will continue to be supported through CAPS. EPS incorporates a dashboard that provides an overview of all account activities – including end of the ACH debits and Trust Balance. From there, mailers can drill down, seeing postage spent by class of mail, and postage statement reports. Many of the reports can be downloaded in CSV format for additional analysis. So, 7 or 8 simple steps, with 8 months to switch over. Plenty of time, right? Start with Step 1 – mailers must decide whether they will fund their EPS account through ACH Debit or a Trust Account. For mail operations, this will mean working with corporate finance/accounting to choose the best payment option, establish the necessary internal controls and test the new funding mechanism. Include in those tests must be the internal request and approval process, followed by the actual release of funds by the bank. Next is Step 2 – Get a list of your active permits. There may be more accounts than the ones used on a regular basis – a Business Reply Mail account that is only used for an annual survey, a permit account established by an acquired company years ago, or a meter account in a small satellite office. Too many operations have found themselves without sufficient funds to process critical mailings or pay for post office boxes or Business Reply Mail. Avoid those situations by getting started with the transition to EPS today!